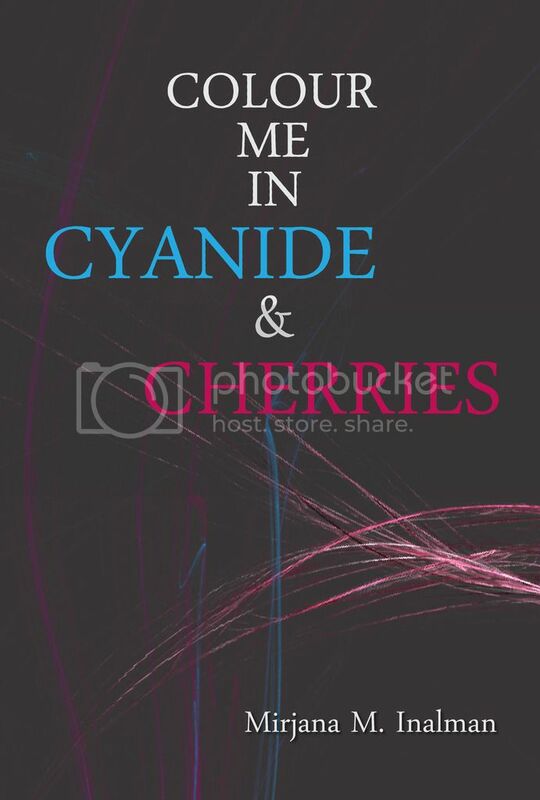 “Colour Me In Cyanide & Cherries” is my first book of poetry and it is finally ready to roam the world. I am heavily pondering about what to write about it, accustomed to most of my readers already knowing what poems are in here, when and why were they written and so forth, so I am having trouble finding the way that could perfectly describe what the poems are about to a traveler, a roamer, a stranger. Most of the poems from this blog are included in the book, some I skipped, some I added. The book is,for now, only available as a print book. I feel incredibly bad charging for anything(even more so when the available platforms mandate a hefty price in order for the writer to earn anything at all), especially for an e-book, since,like I mentioned, reading through this poetic haven of mine is like reading this book of mine, only on screen. I wanted to conjoin all of this writing into a poetic experience and, in a way, provide my soul a chance to be remembered when my shell is no more, a chance for friends and family and/or whoever to get a glance at my heart.It was, is and will always be a scary yet adventurous endeavor. It won’t be available on Amazon for a while, and why? Because myself, an ecstatic idiot, ordered the wrong proof copy without checking inside the right distribution boxes and clicking on the right places and practically waiting in front of the door for the mailman daily instead of correcting said idiocies. Now, I await the correct (hopefully!) proof copy, which I need to approve and then wait a little bit more until my book will be on Amazon and other places as well. I would like to thank everyone who ever read my poetry and took precious time and words of their own, to gift to me and teach me, help me grow and brighten my day, dispel loneliness by an inch. I thanked y’all in the book as well! If you would like to have this book, but don’t want to pay for it, you can’t afford it or just about whatever reason, I would be more than happy to send you a PDF, and I will also give out the book itself in its print glory as soon as I can. Just ask! Thank you all once again for your encouragement, support, time and company on this journey which, I promise, will not end anytime soon! ~ by Oloriel on February 29, 2016. Congratulations and way to go!!!!!! I’m so happy for you. It’s so exciting. A great writer of poetry and prose. Check it out. Very exciting, way to go! Thank you so much for the reblog, I really appreciate it! You’re welcome! Congrats on the new release! Thank you, that is a great compliment to hear, I have been sporting this title for years on my blogs and creations! I am happy I could in some way return and commend for your friendship and endless support! You are awesome! She is the real deal, a poet, a genius, and a wonderful friend! my pleasure I am so happy for you! Thank you! I don’t think it will be on Amazon before late April, but I am very grateful for the support! THANK YOU! Thank you very much, Bjorn! I know exactly what you mean with pushing up forever. I realize within this book there is poems I have written while I was still in elementary school. How exciting & big congratulations to Mirjana! Look out for this piece of gem. I’m sure wouldn’t want to miss this. Thank you very much for the reblog, I really really appreciate the support and help in spreading the word! Wow! I LOVE the title and cover art. It looks enticing. I’ll order a copy soon. Cannot wait to read it. I’m sure I will. I will order my copy once it is available on Amazon. Congratulations!! What an amazing accomplishment. I can’t wait to order my copy and read your beautiful words. Awesome!! I am SO excited for you!! 🙂 *happy dance* ❤ Much love to you. Hi there!! Congratulations!! I have just now re-blogged an author friend, but I would like to re-blog this post tomorrow if you can send me a reminder. Lyme brain, I am afraid I will forget if I don’t ask you to remind me. This does serve as a reminder my friend. Thank you so much for understanding and for being so kind. Huge hugs and smiles as you go about your day. Thank you very much, and likewise! I look forward to reading your blog! Congratulations, Oloriel. I am so glad to know that your enchanting verses are now available in print as well. I am blessed to know so many talented people here; but what’s more, is the kindness I know here. These re-blogs are my way of saying thank you for how you touch my life. I can never thank you enough, not only for the reblog, but for daily giving me inspiration on how to be a kinder person, how to love, grow and keep going, despite any and whatever life carries. Bless you, Belinda! Sent. Do let me know if it arrived to you.